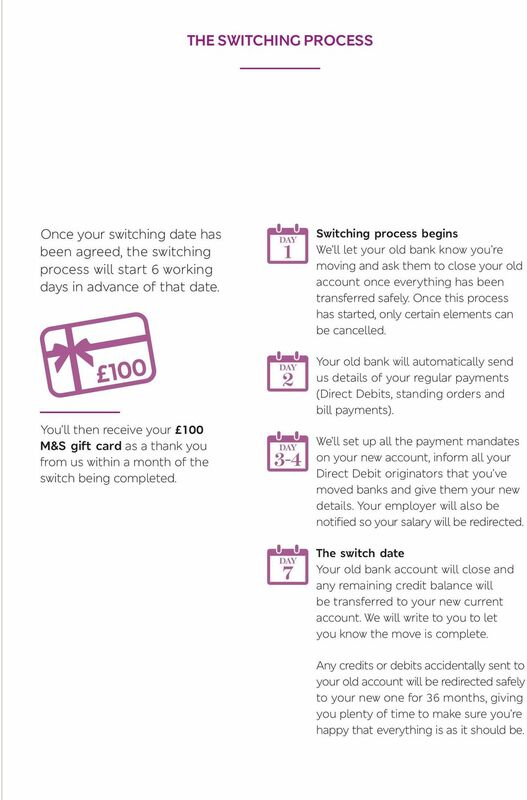 Download "Switching your everyday banking"
2 SWITCH TO US Next steps for claiming your 100 M&S gift card We re waiting to send you your 100 M&S gift card all you need to do is make your new account your main current account. So what will you use your 100 M&S gift card for? You could treat yourself to a new outfit or something lovely for your home. Or invite some friends over for drinks and dinner courtesy of the M&S Food Hall. The great news is it s never been easier to move your everyday banking from your old account to your new one. It s simple and our dedicated switching team is on hand should you have any questions. EVERYDAY BANKING EXPLAINED Your everyday banking covers things such as regular payments that go into your account, like a salary or pension, for example, and payments that leave it like Debit Debits, standing orders and utility bills all the things that make your account your main current account. 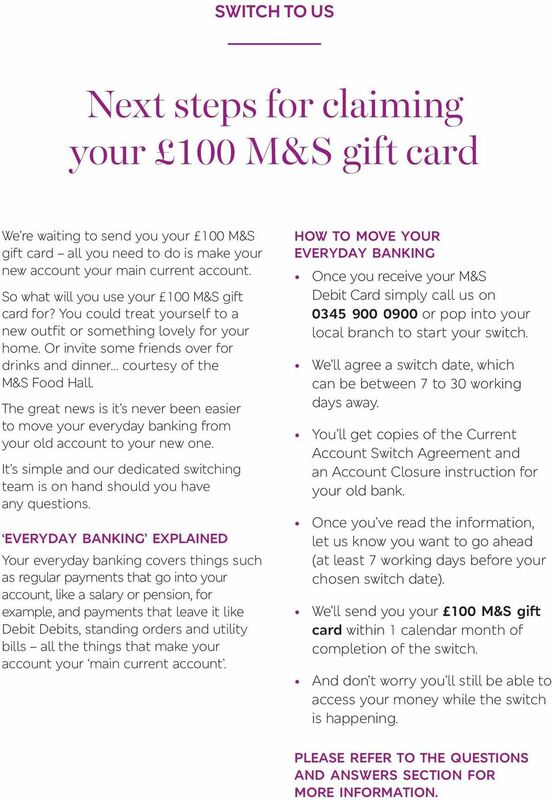 HOW TO MOVE YOUR EVERYDAY BANKING Once you receive your M&S Debit Card simply call us on or pop into your local branch to start your switch. We ll agree a switch date, which can be between 7 to 30 working days away. You ll get copies of the Current Account Switch Agreement and an Account Closure instruction for your old bank. Once you ve read the information, let us know you want to go ahead (at least 7 working days before your chosen switch date). We ll send you your 100 M&S gift card within 1 calendar month of completion of the switch. And don t worry you ll still be able to access your money while the switch is happening. PLEASE REFER TO THE QUESTIONS AND ANSWERS SECTION FOR MORE INFORMATION. 4 QUESTIONS AND ANSWERS Just in case we ve missed anything We re happy to answer any queries you have about transferring your everyday banking. Please give us a call on Meanwhile, we hope these questions and answers are useful. WHAT IS THE CURRENT ACCOUNT SWITCH SERVICE? It s a free service that lets you switch your current account from one participating bank or building society to another. It has been designed to be simple, reliable and hassle-free and is backed by the Current Account Switch Guarantee. CAN I SWITCH MY ACCOUNT ON A DATE THAT SUITS ME? Yes, you can select and agree a date with your new bank or building society and the process will start 6 working days before that date. (Working days are Monday to Friday, excluding bank and public holidays.) WILL BANKS AND BUILDING SOCIETIES OFFER THE SAME CURRENT ACCOUNT SWITCH SERVICE? Yes, it will be a standardised service. 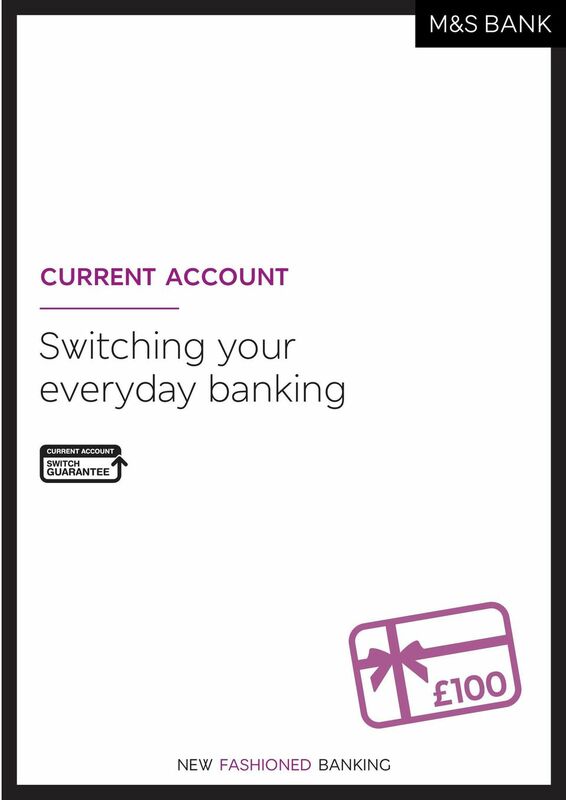 All banks and building societies that display the Current Account Switch logo will offer the Current Account Switch Service. WHAT IS THE CURRENT ACCOUNT SWITCH GUARANTEE? The guarantee sets out the key benefits of the new service and specifies that you will be refunded any charges and interest incurred on your old or new bank account as a result of a failure of the service. 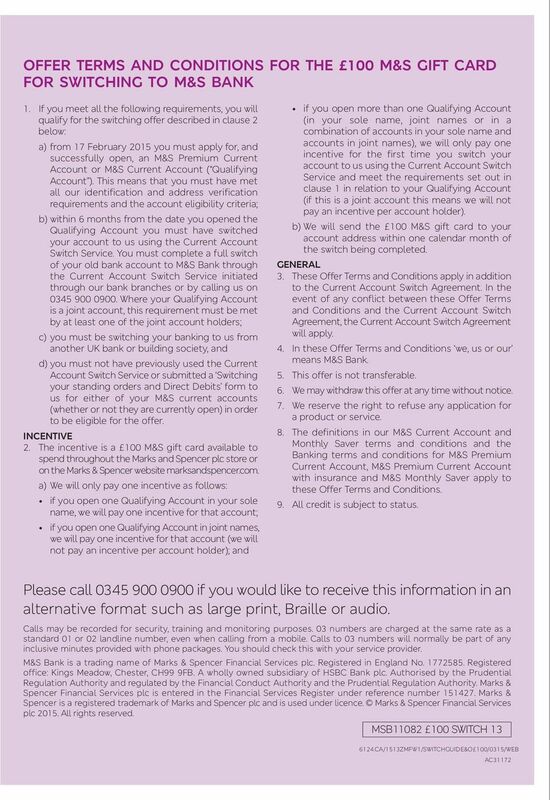 All banks and building societies that display the Current Account Switch logo will offer the Current Account Switch Service and abide by the guarantee. ARE ACCOUNT OPENING AND ACCOUNT SWITCHING ALL PART OF THE SAME PROCESS? Account opening and account switching, ie moving your everyday banking, are separate processes. A current account provider has to carry out know your customer checks as part of the account opening process. Once these are complete to the satisfaction of the new bank, the customer can choose and agree their switch date with their new bank. 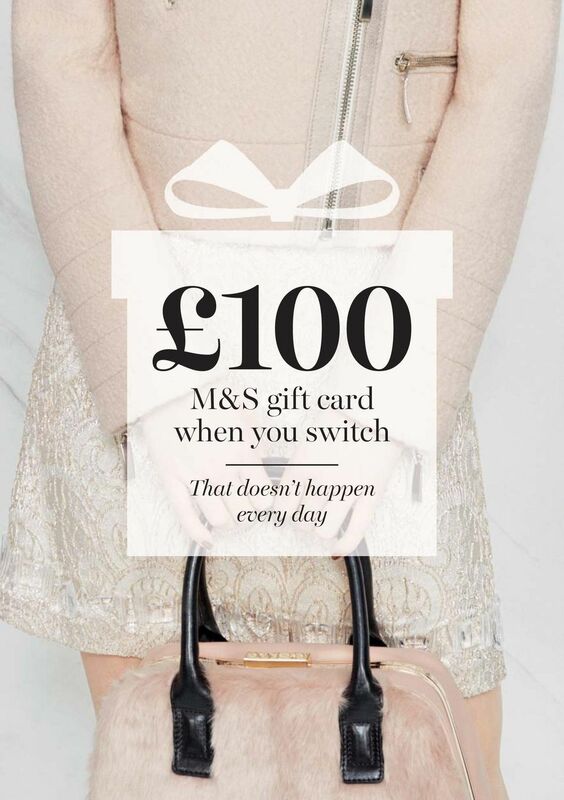 To move your everyday banking and claim your 100 M&S gift card, call us on or pop into your local branch. 5 DO I NEED TO UPDATE MY DETAILS WITH MY OLD BANK? If the details you provide to your new bank do not match the details held by your old bank then you may be asked to contact your old bank to update the details they hold about you. Examples include if you have got married and not changed your maiden name to your married name or if you have moved house and not told your old bank your new address. 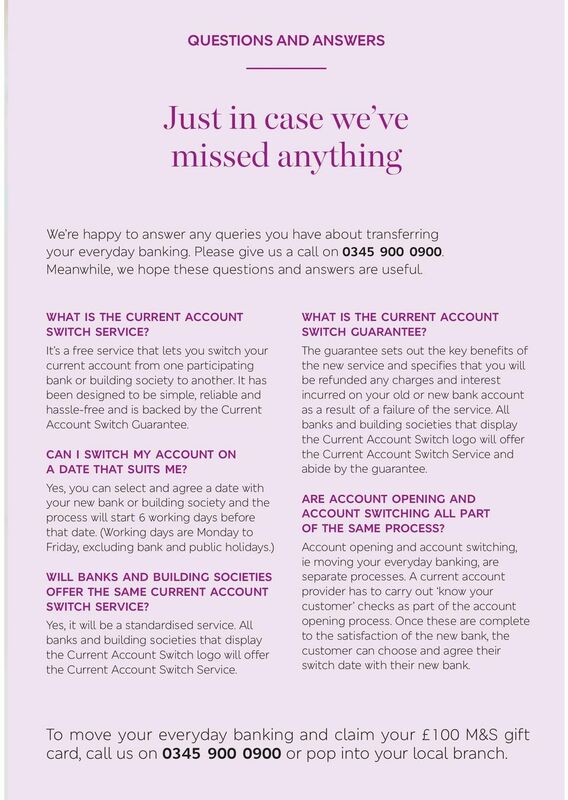 When you are updating your details at your old bank you do not have to tell them that you will be switching to a new bank. WHAT HAPPENS IF THERE IS A MISTAKE OR UNNECESSARY DELAY IN MY SWITCH? The Current Account Switch Service is backed by the Current Account Switch Guarantee. This guarantees that any charges or interest incurred on your old or new account, as a result of a failure in the switching process, will be refunded when you bring this to your new bank or building society s attention. WHAT HAPPENS TO PAYMENTS THAT PEOPLE SEND TO MY OLD ACCOUNT? The Current Account Switch Service will redirect payments to your new account for up to 36 months from your switch date. WHAT IF I CHANGE MY MIND? You can cancel your switch up to 7 working days before your switch date. After that only certain elements of the switch can be cancelled. Your new bank or building society will guide you through the process if you choose to do this. Once the switch process starts, you cannot cancel the closure of your old account. WHAT WILL HAPPEN ON MY SWITCH DATE? Your payments (such as Direct Debits or standing orders) will have all been transferred to your new account. Any credit balance from your old account will have been transferred to your new account. Your old account will be closed. WILL I GET CONFIRMATION THAT MY SWITCH IS COMPLETE? Yes, we will send you a letter of confirmation. WHAT HAPPENS TO ANY DEBIT CARD TRANSACTIONS THAT I HAVE ASKED MY OLD BANK TO STOP? 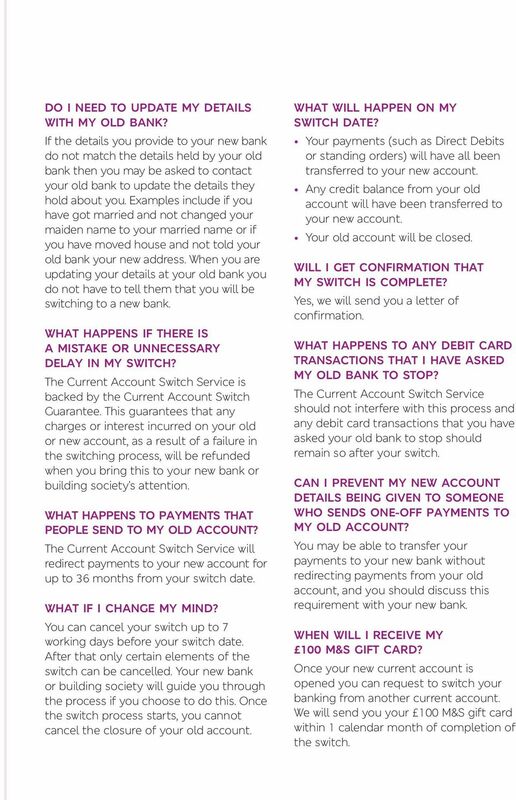 The Current Account Switch Service should not interfere with this process and any debit card transactions that you have asked your old bank to stop should remain so after your switch. CAN I PREVENT MY NEW ACCOUNT DETAILS BEING GIVEN TO SOMEONE WHO SENDS ONE-OFF PAYMENTS TO MY OLD ACCOUNT? You may be able to transfer your payments to your new bank without redirecting payments from your old account, and you should discuss this requirement with your new bank. WHEN WILL I RECEIVE MY 100 M&S GIFT CARD? Once your new current account is opened you can request to switch your banking from another current account. We will send you your 100 M&S gift card within 1 calendar month of completion of the switch. 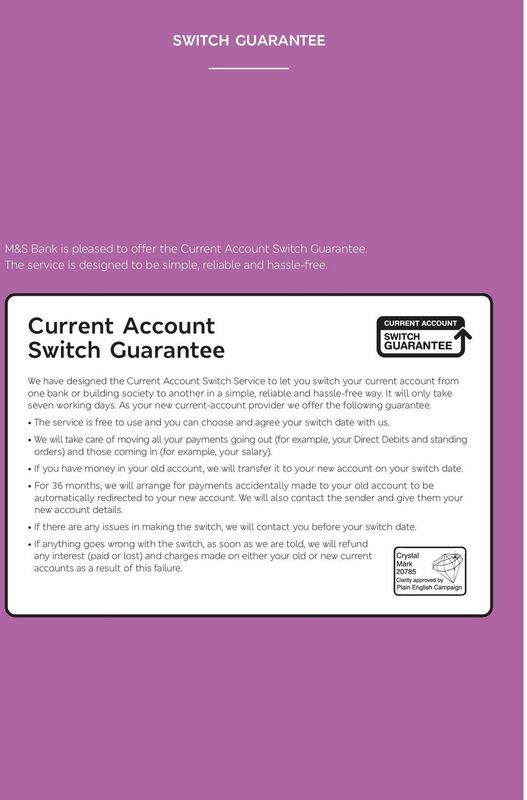 6 SWITCH GUARANTEE M&S Bank is pleased to offer the Current Account Switch Guarantee. The service is designed to be simple, reliable and hassle-free. Current Account Switch Guarantee We have designed the Current Account Switch Service to let you switch your current account from one bank or building society to another in a simple, reliable and hassle-free way. It will only take seven working days. As your new current-account provider we offer the following guarantee. The service is free to use and you can choose and agree your switch date with us. We will take care of moving all your payments going out (for example, your Direct Debits and standing orders) and those coming in (for example, your salary). If you have money in your old account, we will transfer it to your new account on your switch date. For 36 months, we will arrange for payments accidentally made to your old account to be automatically redirected to your new account. We will also contact the sender and give them your new account details. If there are any issues in making the switch, we will contact you before your switch date. If anything goes wrong with the switch, as soon as we are told, we will refund any interest (paid or lost) and charges made on either your old or new current accounts as a result of this failure. 7 THE SWITCHING PROCESS Once your switching date has been agreed, the switching process will start 6 working days in advance of that date. You ll then receive your 100 M&S gift card as a thank you from us within a month of the switch being completed. Switching process begins We ll let your old bank know you re moving and ask them to close your old account once everything has been transferred safely. Once this process has started, only certain elements can be cancelled. Your old bank will automatically send us details of your regular payments (Direct Debits, standing orders and bill payments). We ll set up all the payment mandates on your new account, inform all your Direct Debit originators that you ve moved banks and give them your new details. Your employer will also be notified so your salary will be redirected. The switch date Your old bank account will close and any remaining credit balance will be transferred to your new current account. We will write to you to let you know the move is complete. Any credits or debits accidentally sent to your old account will be redirected safely to your new one for 36 months, giving you plenty of time to make sure you re happy that everything is as it should be. What are the benefits of MoneyMaking Checking when I meet al qualifications? What are the requirements that must be met to qualify for the benefits?